stitching "Friend of the Jews"
Davi Walders has written an important book that brings to light many of the roles women played in resistance to the Holocaust. This is history that is exciting and inspiring. With the publication of Women Against Tyranny, Davi Walders gives recognition to the women who fought for human rights, sacrificed their lives in many cases and in the process saved many innocent lives. This is a unique and extraordinary collection of poems and narratives which opens new avenues of representation for teaching Holocaust literature. Davi Walders knows so many Holocaust heroes (e.g. Dr. Rita Levi-Monatalcini, Sophie Scholl, Cory Ten Boom, Zivia Lubetkin) so well that she writes persona poems, poems in the voices of the women themselves. I cannot imagine teaching Holocaust literature without "The Silence at Treblinka" or "Lidice Survivor" or any of the invaluable texts she now offers teachers and reader who are willing to open themselves to new and even startling voices. 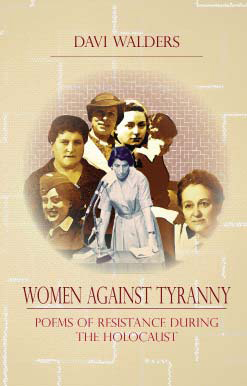 In addition to ordering WOMEN AGAINST TYRANNY from Clemson University Press or Davi Walders, the book is available at libraries; Politics and Prose Bookstore, Washington, DC; and the United States Holocaust Memorial Museum, Washington, DC.